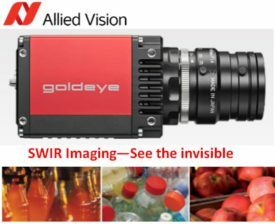 Short Wave Infra-Red (SWIR) imaging is now more economical with the introduction of Allied Vision’s TECless Goldeye cameras. SWIR cameras open up numerous application possibilities for machine vision solutions, since they are able to detect defects that are not visible to the naked eye. SWIR cameras have an InGaAs (Indium Gallium Arsenide) sensor that detects wavelengths between 900nm and 1,700nm. These wavelengths are invisible to the human eye and CCD / CMOS cameras, however SWIR cameras detect the invisible wavelength found in various applications. For example water accumulations inside fruits or defects within silicon products. Learn more about applications solved with SWIR cameras HERE. SWIR cameras typically require Thermal Electric Coolers (TEC’s) which enable low-noise imaging in the spectral range of 900mm to 1,700nm. Additionally, the TEC’s compensate for high temperature fluctuations and stabilizes the image sensor. For temperature stable environments, Allied Vision now has a “TECless” InGaAs camera providing a lower entry price point, in turn an excellent price-performance ratio. GigE and Camera link interfaces. Need to see it for yourself? 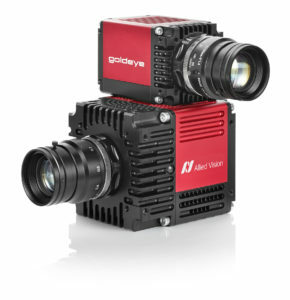 1stVision can provide a demo Goldeye camera to test on your application. Submit your request for a demo camera by entering “Send me a demo SWIR camera” in the comment box. Download the comprehensive SWIR application white paper here. 1st Vision’s sales engineers have over 100 years of combined experience to assist in your camera selection. With a large portfolio of lenses, cables, NIC card and industrial computers, we can provide a full vision solution! How to select the best SWIR camera for my application and understand applications it can solve. Download the comprehensive SWIR application white paper. Next PostNext Get a 5MP lens for the price of a 3MP one! FUJI’s new XA-5M lenses.